CLEVELAND + AKRON'S PREMIER TWILIGHT HOME PHOTOGRAPHERS. WE OFFER THE MOST BREATH-TAKING TWILIGHT HOME PHOTOGRAPHS THAT ARE SURE TO MAKE YOUR PROPERTY STAND OUT ABOVE THE COMPETITION. CUSTOM SKIES ARE PHOTOSHOPPED WHEN NATURE DOESN'T COOPERATE, WHICH GUARANTEES THE MOST AMAZING SHOT, REGARDLESS OF THE WEATHER! We are the leaders in Twilight Real Estate Photography in Cleveland and Akron, servicing all of North East Ohio. There's nothing more magical to capture architectural design and set your real estate listing apart from the competition, than a twilight photo. We would love to help you stand out in the luxury real estate market with one of these amazing twilight photos! The above shots are REAL twilight photos - NOT photoshopped day-to-dusk. Read more about twilight vs day-to-dusk photography below. For Realtors with single property photo shoots - add a twilight shot to your photo package for only $99. -The first shot seen by perspective buyers determines if they will click through to see the remaining. Capturing a magical twilight shot will increase your chances dramatically to get more buyers through the door. For higher end listings and luxury real estate, twilight shots are a must for marketing! 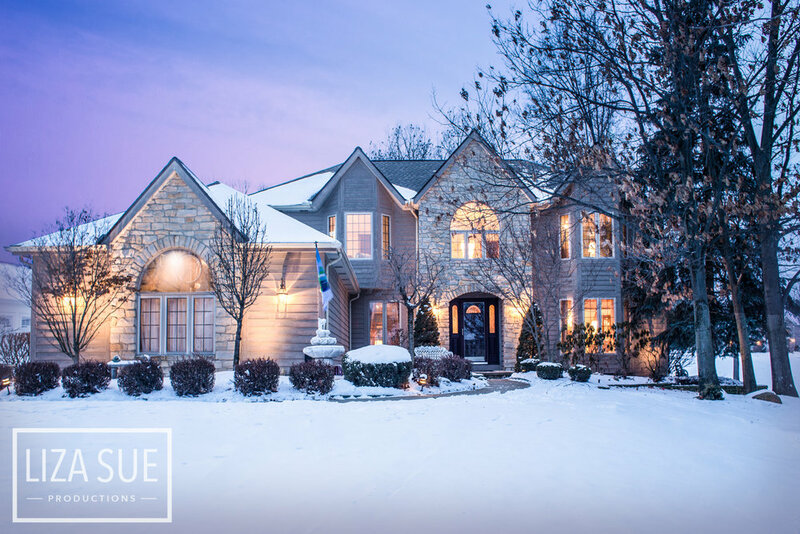 -Capturing a twilight shot during Cleveland winters is really helpful and one of the most beautiful ways to enhance your marketing strategies during winter month real estate sales. -Twilight shots are captured just after sunset. To prepare for them, sellers should turn on all exterior and interior lights in the front of the house. This gives the magic glow pictured above. -Freshly manicured landscaping is always recommended and any landscape lighting should be turned on to really make the shot magical. -For MLS marketing guidelines, ALL signage should be removed from the yard. Please CONTACT us today to book your twilight photograph! Real twilight photography is captured at dusk - right after the sun sets. The beautiful images are a result of the light of the sky and the lights inside being an equal ratio - which allows the photos to show off the interior of them - in a glowing warm light. This magical light makes any home or architectural masterpiece look special! Day-to-dusk photo editing has a similar effect, but not quiet as magical as a real twilight photo because the glowing windows are painted on in Photoshop with a sheer layer of warm color. This does not allow you to see into the actual home like a real twilight photo does. For some purposes and budgets, it’s a great alternative - but a real twilight photo will always deliver even more impact. See the difference in the windows below. Day-to-dusk is still a beautiful option of you’re on a budget!